Stunning handmade fusion glass wall clock. 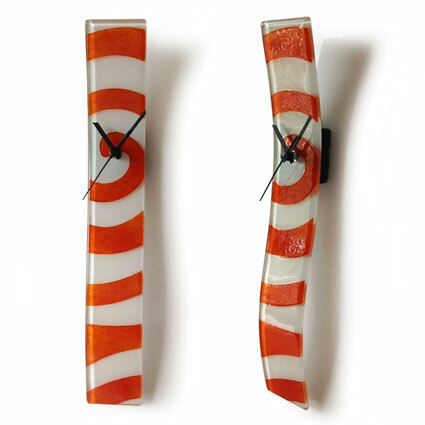 Set with a white glass paint finish to the reverse of the clock, then fused on top of the glass is a contemporary jazz orange swirls design. The clock is made in an eye catching and very contemporary slim curving design - great on any wall in any room in any home/office! Width is 6cm and length is a nice 41cm. This clock is handmade and to a high design quality, sure to draw comments from everyone who sees it!